Turning Point launched a television program in 1982 in San Diego and went nationwide in 2000. Now seen around the world through cable and satellite technology, as well as on terrestrial stations all across the United States, conservative estimates suggest that close to 200 million homes around the world have access to Dr. Jeremiah’s Bible teaching each week. 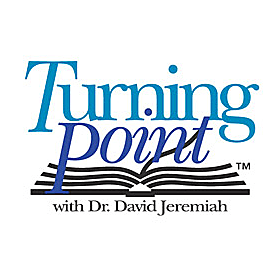 Turning Point Television offers a half-hour Bible study message and a full hour worship service with the same great preaching. The program airs on national networks including TBN, ION, Daystar, INSP, USA, Lifetime, UPtv and ABC Family. Along with his speaking schedule around the country, Dr. Jeremiah also finds time to fulfill another passion in his life, writing. His books are always gripping and right to the point. Some of his books include Escape the Coming Night, The Power of Encouragement, What the Bible Says About Angels, Prayer The Great Adventure, which brought him The Gold Medallion Award in 1998, God In You, Gifts from God, Jesus’ Final Warning, A Bend in the Road, Slaying the Giants in Your Life, My Heart’s Desire which gave him another Gold Medallion Award in 2003, Sanctuary, his first daily devotional book, The Things that Matter, The Prayer Matrix, Searching for Heaven on Earth, a book that he co-authored with world renown artist, Thomas Kinkade, The Secret of the Light, a second devotional book, Turning Points, Captured by Grace, which put Dr. Jeremiah on the best-sellers list for USA Today and The Wall Street Journal, Signs of Life, which made The New York Times best-seller list, What in the World Is Going On?, which made The New York Times, Wall Street Journal, and USA Today best-seller lists, The 12 Ways of Christmas, Living With Confidence in a Chaotic World, which made The New York Times, Wall Street Journal, Publisher’s Weekly, and USA Today best-seller lists, The Coming Economic Armageddon, which made The New York Times, Wall Street Journal, USA Today, and Publisher’s Weekly best-seller lists, I Never Thought I’d See the Day! Culture at the Crossroads, God Loves You: He Always Has — He Always Will, What Are You Afraid Of?, Agents of the Apocalypse, and his most recent book, Agents of Babylon.